Explanation: Want to use a cluster of galaxies as a telescope? It's easier than you might think as distant galaxy clusters naturally act as strong gravitional lenses. In accordance with Einstein's theory of general relativity, the cluster gravitational mass, dominated by dark matter, bends light and creates magnified, distorted images of even more distant background galaxies. This sharp infrared Hubble image illustrates the case for galaxy cluster Abell 68 as a gravitational telescope, explored by amateur astronomer Nick Rose during the ESA-Hubble Hidden Treasures image processing competition. Putting your cursor over the picture will label highlights in the scene. Labels 1 and 2 show two lensed images of the same background galaxy. The distorted galaxy image labeled 2 resembles a vintage space invader! Label 3 marks a cluster member galaxy, not gravitationally lensed, stripped of its own gas as it plows through the denser intergalactic medium. Label 4 includes many background galaxies imaged as elongated streaks and arcs. Abell 68 itself is some 2.1 billion light-years distant toward the constellation Vulpecula. 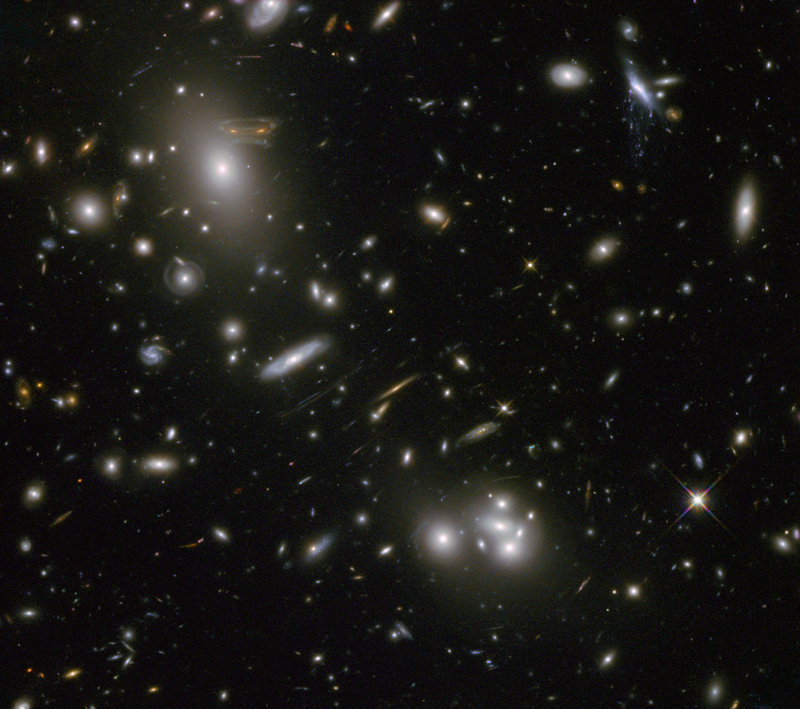 The central region of the cluster covered in the Hubble view spans over 1.2 million light-years.